For the first time, American Masters profiles a sports figure: Billie Jean King, a determined woman who has been a major force in changing and democratizing the cultural landscape. American Masters Billie Jean King premieres nationally Tuesday, September 10, 2013 at 8 p.m. on PBS (check local listings) to commemorate the 40th anniversaries of the Billie Jean King v. Bobby Riggs “The Battle of the Sexes” match on Sept. 20, 1973, and the founding of the Women’s Tennis Association (WTA) by King on June 20 of that year. This new documentary traces the incredible life of the single most important female athlete of the 20th century as her 70th birthday nears. American Masters looks back to the 12-year-old Long Beach, California, girl who played tennis on public courts, observed disparity and, as she soared athletically, never stopped trying to remedy inequality. 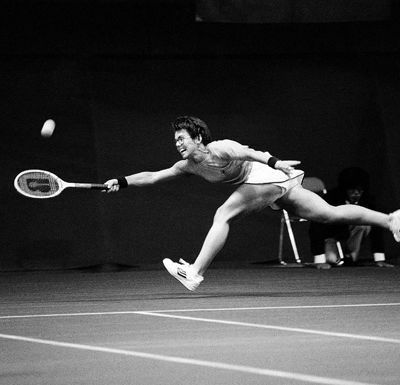 During her professional tennis career, King won 39 Grand Slam titles, helped form the Virginia Slims Series (pre-cursor to WTA Tour), founded the Women’s Sports Foundation and Women’s Sports magazine, and co-founded World TeamTennis (WTT). Her competitiveness on the circuit was matched by her efforts on behalf of women and the LGBT community, and her commitment to prove there is strength in diversity. In American Masters Billie Jean King, King presents her own story with perspective from fellow tennis stars that played alongside her or were influenced by her, among them Margaret Court, Chris Evert, Ilana Kloss (King’s partner), Maria Sharapova, Serena and Venus Williams, Caroline Wozniacki, and members of the Virginia Slims Circuit “Original 9,” including Peaches Bartkowicz, Rosie Casals, Julie Heldman, Nancy Richey, and Valerie Ziegenfuss. The film also features new interviews with a diverse cast of characters from King’s unparalleled life: former U.S. Secretary of State Hillary Clinton, friend and fellow activist Sir Elton John, feminist icon Gloria Steinem, Bobby Riggs’ son Larry and “Battle of the Sexes” trainer Lornie Kuhle, King’s brother Randy Moffitt and ex-husband Larry King, and Valerie Jarrett, Senior Adviser to President Obama, who chose King as the first female athlete to be awarded with the Presidential Medal of Freedom. King is also a member of the President’s Council on Fitness, Sports and Nutrition. Through these interviews and archival footage, the film illustrates the life of a woman whose journey became not just a battle for personal glory but a sociopolitical battle for equality for all.